CAIRO, Egypt - The Hamas-led Palestinian government agreed Sunday to an international peace conference with Israel after the Arab League - angered by Israel's military offensive in Gaza - voted to end a financial blockade on the Palestinians. Foreign Minister Mahmoud Zahar of Hamas endorsed a statement by Arab foreign ministers calling for the peace conference during a meeting in Cairo to respond to a US veto of a UN Security Council resolution condemning the Gaza offensive. Israel responded by saying it would not hold talks with Hamas unless it agreed to demands, backed by the US and Europe, that the group recognize Israel, renounce violence and abide by existing agreements between Israel and Palestinians. Zahar said the Palestinians had asked for the peace conference "in order to reach just and comprehensive solutions." 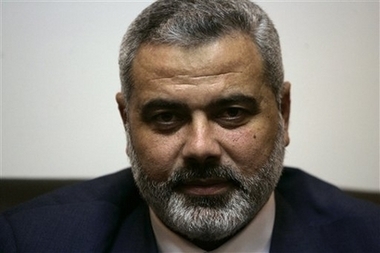 The acceptance marked the first time the Hamas-led government has indicated it would consider making amends with the Jewish state. The West cut off hundreds of millions of dollars in international aid and tax revenues to the Palestinians after Hamas took power in March in an effort to pressure the Islamic militant group to moderate its anti-Israel ideology. Israel made clear that Hamas' shift fell short of its demands. Mark Regev, a foreign ministry spokesman, said he was not aware of the conference proposal. But he said Hamas could not be a party to talks with Israel unless it met the international community's stipulations. "A multilateral conference doesn't make Hamas legitimate," Regev said. "What makes Hamas legitimate is accepting the international benchmarks." Hamas' decision came as Israeli Prime Minister Ehud Olmert arrived in Washington Sunday ahead of a meeting with President Bush on Monday. The Arab League statement said ministers sought a conference to resolve the Israeli-Palestinian conflict "according to international resolutions and the principle of 'land for peace'." Arabs want Hamas to endorse a 2002 Arab initiative that calls for peace in exchange for land seized by Israel in the 1967 Middle East war - the West Bank, the Gaza Strip and east Jerusalem. Sunday was the first time Zahar had attended an Arab foreign ministers' meeting since Hamas became the ruling party. The Arab League had previously refused to let him join unless Hamas accepted the peace initiative. Arab ministers also decided Sunday to end a financial blockade on the Palestinians to show their anger over US veto in the Security Council on Saturday. The U.N. draft resolution would have condemned the Israeli offensive in Gaza that has killed more 50 people recently and also demanded that Israeli troops pull out of the territory. US Ambassador John Bolton said the Arab-backed resolution was "biased against Israel and politically motivated." It was the second US veto of a draft resolution on Israeli military operations in Gaza this year. "There will no longer be an international siege," said Bahrain's Foreign Minister Sheik Khalid bin Ahmed Al Khalifa. The economic sanctions against Hamas have debilitated the Palestinians and have led to clashes between the Islamic militants and the more moderate Fatah party led by Palestinian President Mahmoud Abbas. Abbas has been trying to form a more moderate government and renew the peace process with Israel. Arab banks have not transferred funds to the Hamas-run Palestinian Authority for fear of US-led sanctions. The United States and European Union lists Hamas as a terrorist organization and takes steps against those who transfer funds to such groups. It was not immediately clear whether Arab banks would immediately begin transactions in response to Sunday's decision and if sanctions would be imposed if they did.